HOSE CLAMPS. Buy quality Auto and Marine Electric Parts and Accessories online, Sydney. 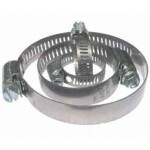 HC4Hose clamp #4 Stainless Steel Band Automotive and general use 6mm - 16mm ⌀ range ..
HC6Hose clamp #6 Stainless Steel Band Automotive and general use 11mm - 22mm ⌀ range ..
HC8Hose clamp #8 Stainless Steel Band Automotive and general use 13mm - 25mm ⌀ range ..
HC10Hose clamp #10 Stainless Steel Band Automotive and general use 14mm - 27mm ⌀ range..
HC12Hose clamp #12 Stainless Steel Band Automotive and general use 18mm - 32mm ⌀ range..
HC16Hose clamp #16 Stainless Steel Band Automotive and general use 21mm - 38mm ⌀ range..
HC20Hose clamp #20 Stainless Steel Band Automotive and general use 21mm - 44mm ⌀ range..
HC24Hose clamp #24 Stainless Steel Band Automotive and general use 27mm - 51mm ⌀ range..
HC28Hose clamp #28 Stainless Steel Band Automotive and general use 33mm - 57mm ⌀ range..
HC36Hose clamp #36 Stainless Steel Band Automotive and general use 46mm - 70mm ⌀ range..
HC44Hose clamp #44 Stainless Steel Band Automotive and general use 59mm - 83mm ⌀ range..
HC48Hose clamp #48 Stainless Steel Band Automotive and general use 65mm - 89mm ⌀ range..